A stroll around the Colombo Museum this holiday season may just provide an intriguing lesson for Sri Lankans celebrating the dawn of the Sinhala and Hindu New Year. 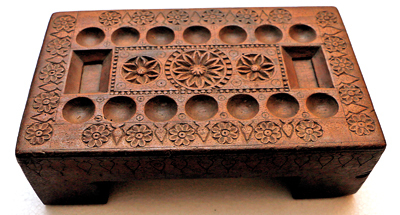 Beautifully carved Olinda boards, milk rice moulds, aluwa moulds and jaggery moulds displayed in the Colombo National Museum’s Anthropology Division give an illuminating glimpse of how our ancestors used to celebrate Avurudu. Information on how they were used was gleaned from the Anthropology Division’s library and the Colombo Public Library. Some of the kitchenware and Olinda boards in the museum collection are not on public display, we learnt. Most of the wooden artifacts are said to belong to the Kandyan period, yet records indicate they may have been in use even before that. “The kitchen utensils with elaborate carvings were believed to have been used by the ancient aristocrats as a way of displaying their social status and luxurious lifestyle,” says folklore researcher Mahinda Kumara Dalupotha. 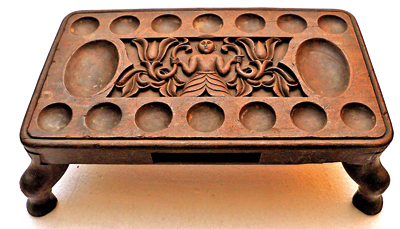 Brass Kokis moulds used to make Kokis, a sweetmeat introduced to this country by the Portuguese belong to a collection donated to the Anthropology Division in 1906. Kokis is made during Avurudu season and at other occasions of festivity and of the two brass moulds, one is in a square pattern, rarely seen nowadays. For Aluwa, a sweetmeat made with rice flour and sugar, the mould is pressed on the Aluwa paste, so the design is imprinted on it. The mould has four different patterns, square and floral, reflecting the intricate craftsmanship of the ancient artists from the Kandyan period. The moulds belong to an artifact collection received by the Division in 1938. The milk rice (Kiribath) mould is another not in use in modern times. The mould has two parts, the frame and the inner carved piece. The outer frame is filled with milk rice and the carved mould is pressed onto the milk rice to imprint the pattern. This was used by the aristocrats who owned these decorative moulds. A piece of milk rice with a pattern on top is again a way of displaying their social status. The commoners neither had access to moulds nor had the time to make decorative milk rice pieces. ‘Olinda Keliya’ the traditional domestic board game associated with Avurudu is a Sri Lankan version of the Mancala board game. ‘Olinda Keliya’ is primarily played by women during their leisure time and on festive occasions. The wooden board also known as ‘Olinda Kolombuwa’ or ‘Olinda Poruwa’ has 14 holes, seven on each side with two large holes at each end. The game is played by two players with ‘Olinda beads,’ a bright red and black seed. According to an ancient Sinhala folk ballad written about ‘Olinda Keliya’ the game originated in Bangladesh. There have been many versions of ‘Olinda Keliya’ such as Colombo boards, folding Tamil boards, Mandika boards, and Arab boards. There is also evidence that it was played in the time of the Pharaohs in Egypt. In addition, ‘Olinda Keliya’ is played with the belief of evoking the blessing of goddess Pattini. In ancient times, queens and princesses used to play a version of this game called ‘Muthu Poruwa’ (Pearl board), as they used gems and pearls instead of Olinda beads. The rules of the game are simple. A total of 56 Olinda beads are placed in the 14 holes, four beads in each hole. The first player takes four beads from one hole and puts one in each hole. Thus, the players shift the beads from one hole to the other and collect the seeds found in the hole immediately after an empty one. The winner is the player who collects the largest amount of Olinda seeds. The detailed carving on Figure One shows the Nari -Lata –Vela motif, a mythical vine of which the flower has the appearance of a woman. It grows in the Himalayas and the mythical figure of Nari- Lata, of whom the lower part of the figure is portrayed by foliage, is a common element in Kandyan wood crafts. Figure Two has a vivid carving of lotus flower (Nelun Mala). The lotus circle is always divided into even numbers and reflects the geometric skills of the ancient craftsmen.